The Monument is located approximately 400m east of Glasgow Cross, oriented on a north south axis between the Gallowgate and London Road. The east and west boundaries are defined by Charlotte Street and Moir Street respectively. 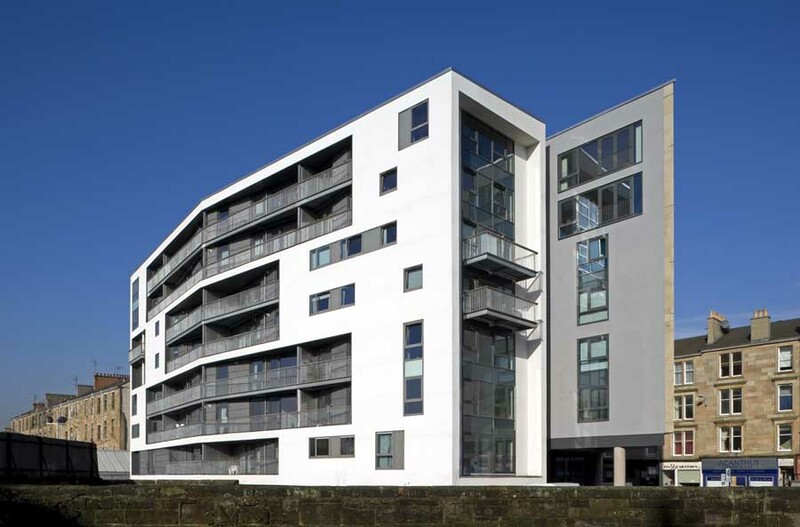 The site offers an excellent opportunity to extend the current high quality residential areas at St Andrew’s Square,Homes for the Future and the Merchant City, into an area which is currently percieved as being run down and undesirable. 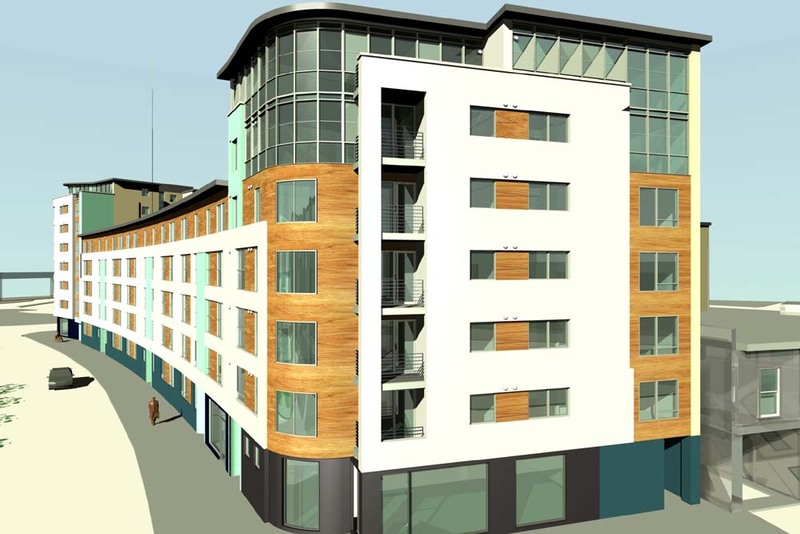 It is intended that the development will be a catalyst for the regeneration of the Gallowgate. In order to attract new people to the area it was felt that a strong, high quality landmark building would be required. 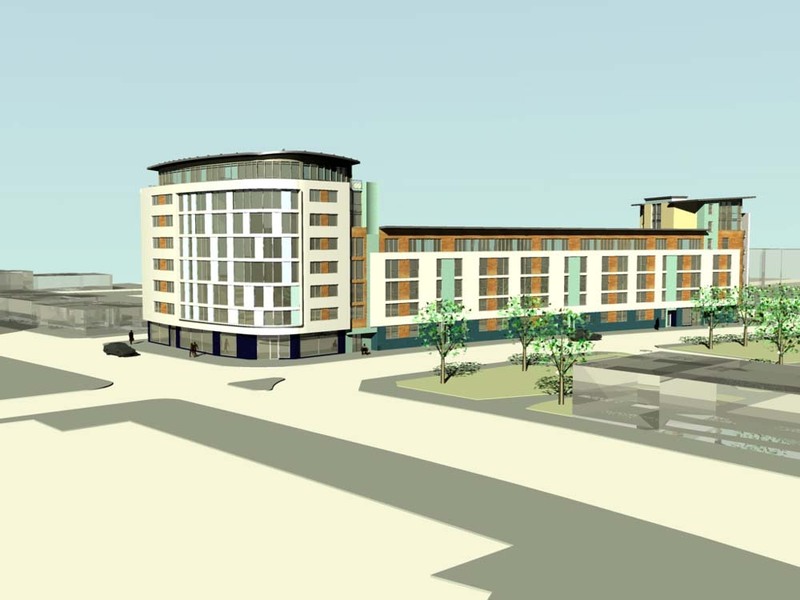 The development would also have to make an impact on the visual links along the Gallowgate and London Road from Glasgow Cross. The final design solution required impressive architectural statements, on the corners of Moir Street, that would be apparent from Glasgow Cross. Ultimately, what we have is a contemporary tenemental urban design solution. 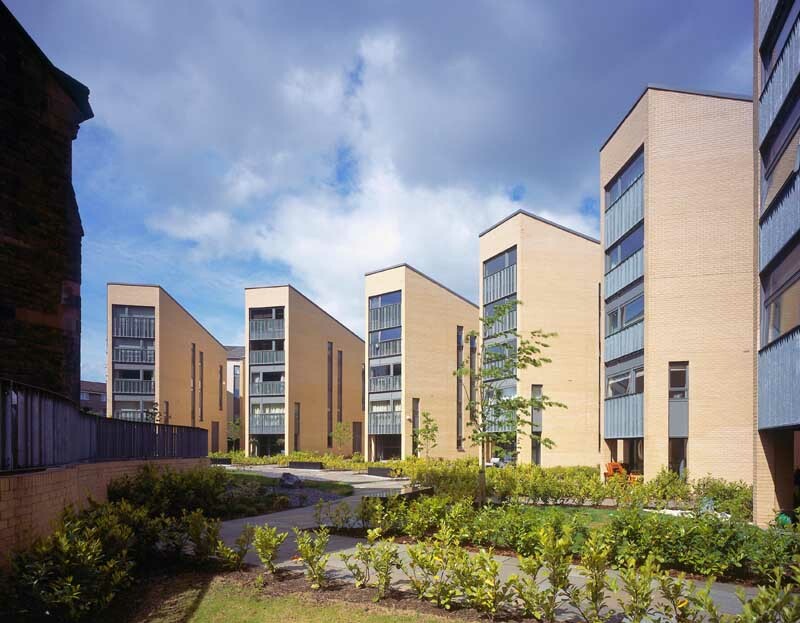 The site is wrapped in 4 basic blocks of accommodation, ranging in height from 5 to 8 storeys. To help create the statements at the corners, we organised the 7 and 8 storey elements in those areas. 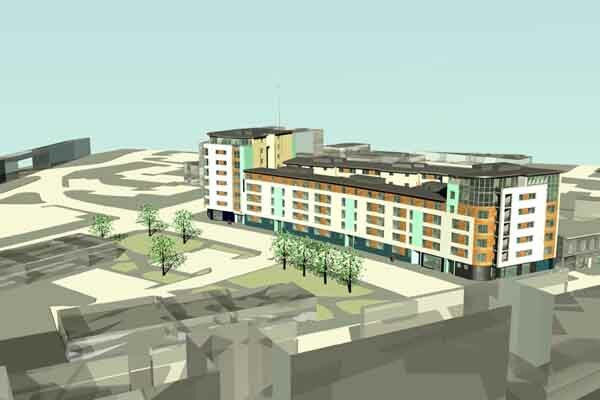 It was also decided to provide “live” accomodation of Retail/Commercial elements at the Ground Floor level of the tower blocks, in order to again enhance the perception of the development being part of a busy town centre. Aesthetically we restricted ourselves to a simple palette of materials, and used them carefully to express the various defined elements and to maintain a scale that is in keeping with the surrounding context. At ground floor we decided to emphasise the domestic scale with facing brick to define a solid base. The Retail/Commercial units are picked out in a larger format finish, which reflects the differing functions and activities. In adding cohesion to the overall scheme we wrapped floors 1 to 4 in a band of cedar, secured by solid slabs of white rendered masonry clipped over. The resulting banding has helped reduce the scale of the building along with the light glass boxes used on the top floors of the towers. The horizontal emphasis is punctured at intervals by distinctive green/blue glazed brick elements which thread down through the banding to highlight the close entrances and articulate between the varying height blocks. Along with the generous room sizes, we decided to maximize daylight ingress through using large windows to the open-plan Lounge/Dining/Kitchen areas. 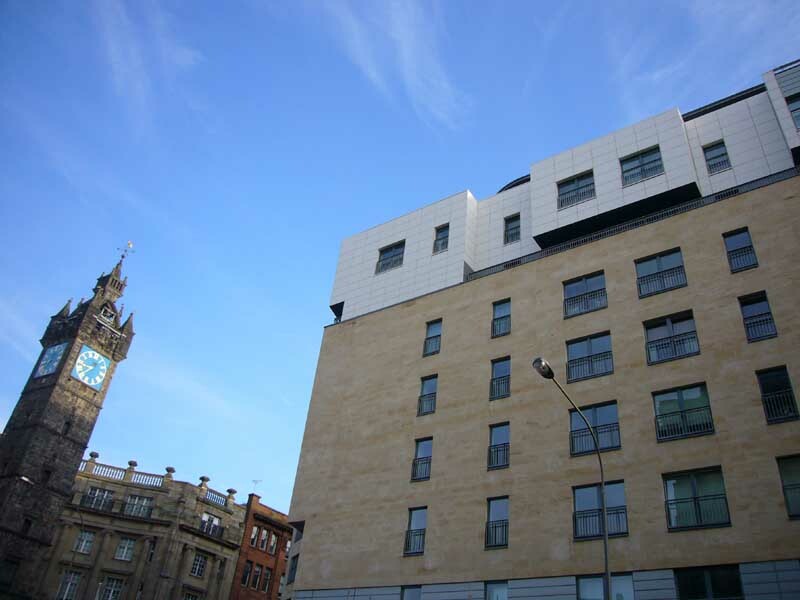 With a large Scottish Power station as a close neighbour on Charlotte Street, it was also decided to orientate all the habitable rooms in the Charlotte Street flats, away from the Street façade. It was agreed from the outset that the development would follow Glasgow City Council’s policy for Car Free schemes. As such we increased the amenity offered to the prospective owners by way of a generous, high quality and well lit central courtyard, which was designed by a Landscape Architect. Access to the courtyard is controlled at the 2 access pends. 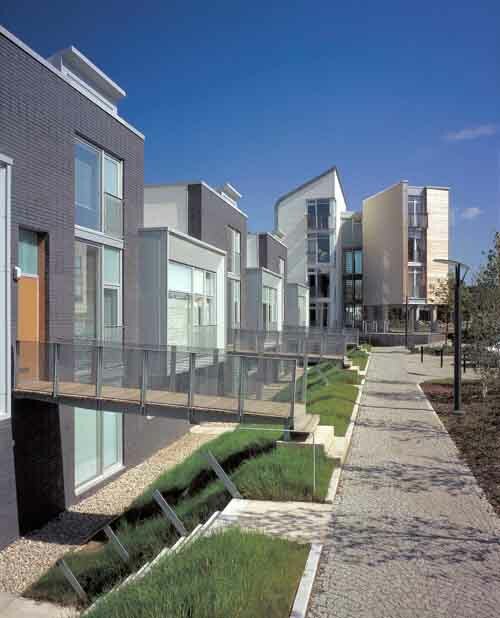 Another requirement of the Car Free policy is that a generous amount of communal storage facilities and bike stores should be provided – this has been incorporated into the courtyard landscape design. 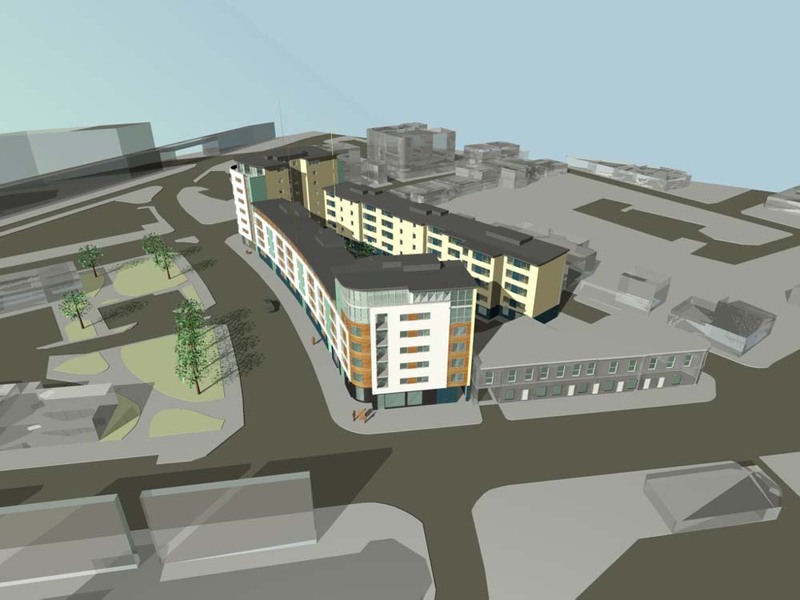 The Client’s current programme, has the works due to commence on site in May 2002, with completion due around the middle of 2003.